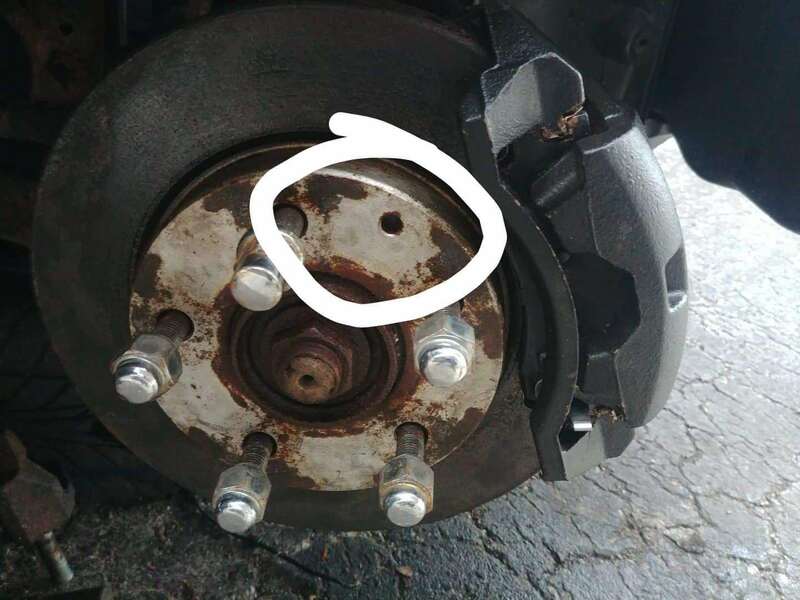 Like the title says, im having trouble with my 2 front rotors being really stuck. I replaced all four calipers and did all my breaks except for my front rotors. All i did was hammer the rotor but it wont even slightly bulge and spray it with pb blaster. What is the size of a bolt that I can put in the hole on the front rotor? (circled on the picture below). And is there another way to try to break it free? Last edited by heyitsrain; 11-07-2018 at 10:41 PM. I have a snapon dead blow I use to break these suckers free but the trick is to hit the hat between the lug studs. See if you have a bigger hammer? I hope you’re not using a claw hammer. On my car, the t-bolt that holds down the jack in the trunk fits that threaded hole. You could see if it fits the threaded hole then us it to take to the hardware store to match up to a bolt. It's made out of cheap metal and you'll need a better quality bolt. My front rotors come right off after taking off the caliper. I don't know how it'd be stuck on there that badly. No issue in this CA . Try some heat with a torch. Focus on the rotor around the hub, between the studs. I had to buy a sledgehammer to get my wheels and rotors off. I took off the lug nuts and booted the hell out of the tires and they wouldn't budge. My 8 pound sledgehammer worked though,.. tires and rotors. To the OP... Put some grease or anti-seize between the hub and rotor and between the rim and rotor... It makes getting them off way easier next time. Last edited by pcb; 11-10-2018 at 12:32 PM. This is the price we pay for living in the great white North. Pretty much every car I've owned I've had to hammer the crap out of the rotors to get them to break loose. On my last car, I used a little wheel bearing grease on the back of the rotor when installing new ones, and that made things a lot easier a few years later. I also do the same (grease the inside) on my wheels/rims before installing them. They come off no problem when I need to swap them out or rotate them later on. Getting back to your problem, one thing I did in the past was to re-install the wheel, but leave the lug nuts slightly loose. Go for a gentle short ride in front of the house, and the weight of the car will break the rust bond on the rotor. Sometimes just rocking the car back and forth with the lugs nuts on loose will break the bond. Not too loose though. You don't want to snap the studs. Short story: A few years ago I was in Florida, and took my 10 year old Nissan Altima in to a local shop in Orlando for a new muffler. The tech couldn't believe the condition of the underside of the car. He'd never seen anything like it. Canada eh. If you are replacing them anyway, take off the caliper and you'll have a big open spot on the rotor. Use the biggest hammer you can find (I use a big deadblow) and hit the rotor from the inside and knock it off. May take a few swings but it'll let loose. 2002 Protege Front Rotor Replacement - Stuck!! !